Q) Why did I change from Church of Scotland to Baptist Church? A) I used to go to Viewfield Church in Stirling which was Church of Scotland. The Church didn't really want to get to know the youth outside the Church. My best friend Graeme and I were the youngest people at the service on Sunday mornings by far. When I went to Abertay University in Dundee, most of my new Christian friends went to Central Baptist and were always talking about how good the preaching was (Rev Jim Clark is superb). I decided to give it a try, and found this to be true. When I graduated and moved back home to Stirling, I began going to Viewfield Church again, but soon found myself leaning towards Stirling Baptist Church where I was welcomed with open arms by many people. Lots of young people (particularly students) go to this Church, and there is plenty to take part in and experience. I began going to this Church from September 1999. My mum still goes to Viewfield Church where she is a Sunday School Teacher. I was never asked to do anything at my church, but at the Baptist Church they really find out what your talents and interests are and put them to good use! Please note that I am a Christian Juggler, available to hire for your occasion! 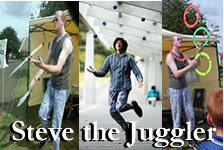 You can find out more about this extraordinary way of presenting the Gospel by visiting the Christian Gospel Juggling page on my juggling website!